Hassey | Do Duy is committed to restoring your smile by offering a variety of restorative dental solutions, including the placement of a dental inlay or a dental onlay. 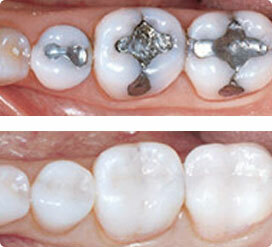 Inlay and onlay restorations are commonly used to repair damage to the biting surfaces of teeth. A dental inlay is used within the interior of the tooth structure, while a dental onlay is used to cover the outer, biting surface of a tooth. A tooth inlay is constructed of special materials and custom made to fit snugly into the prepared cavity. They are often used to repair cavities that are too large for a simple filling, yet still offer an indirect method of treatment. A tooth onlay is often recommended for a tooth that is too damaged to support a dental filling or dental inlay restoration. An onlay covers the entire biting surface of the tooth, protecting it from further decay and deterioration. Dr. Hassey and Dr. Do Duy are experienced at placing inlay and onlay restorations in Methuen MA, and are happy to answer any questions you may have about either procedure. Contact our dental team today and schedule your appointment!